California’s booming Silicon Valley is home to some of the leading technology startups in the world. These rising companies are raising funds and collecting investments back to back. With millions of dollars to spend in their pockets, they only have one thing on their minds – growth. With any business hub, especially those made of rapidly growing emerging industries, comes the crucial need for marketing and advertising to help achieve the level of growth that will take a startup and transform it into a thriving, world-known brand. Whether you are a Silicon start-up or a local San Francisco entrepreneur, selecting a California-based advertising agency that’s a great fit for your business can be a challenging task. 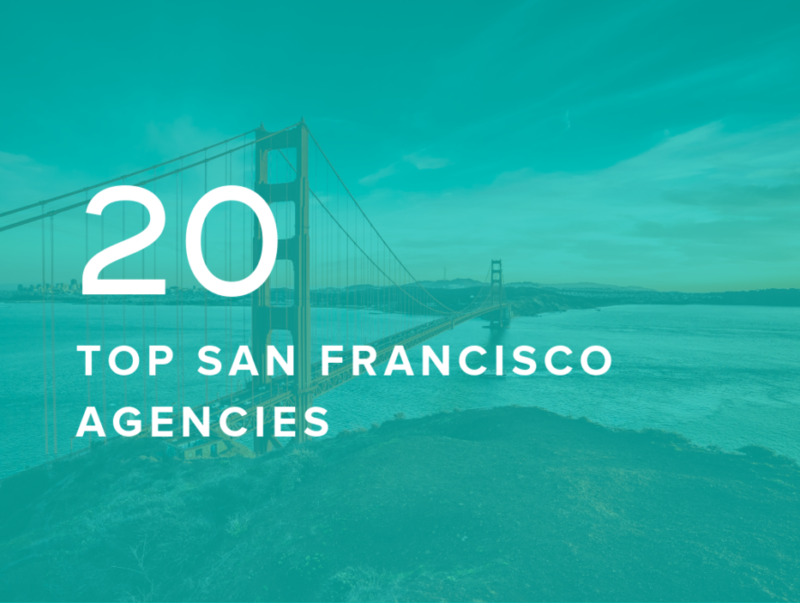 In order to help you find the perfect fit, we’re uncovering 20 of San Francisco’s top marketing and advertising agencies. Utilizing our very own database to deliver you the best of the best, our list is compiled of agencies who have a client media spend of at least $1 million and have a minimum of 50 employees. Recently named a leader in Gartner’s 2019 Magic Quadrant, AKQA is a digital agency that specializes in creating digital services and products using the imaginative application of art and science. Though the San Francisco branch has a few hundred employees, AKQA has 23 studios across the word and over 2,000 employees total. The newly created Archetype was created in 2018 when Bite Communications and Text100 came together to create not only a new agency but a new kind of agency. This agency intends to set the standard for the next generation of global agencies- where marketing and communications have converged, where every company is a tech company, and where global means finely tuned to individual markets. BSSP is one of the largest independent agencies on the West Coast, known for providing highly creative, fully accountable marketing solutions. The agency was named by Adweek as Small Agency of the Decade, one of the best places to work by AdAge, and was recognized by Outside magazine five years in a row as one of the Best Places to Work in America. DDB Worldwide is one of the world’s largest and most influential advertising and marketing networks. It’s known worldwide for introducing an approach to marketing that relies on insight into human nature, respect for the consumer, and the power of creativity. The international organization is owned by Omnicom Group, one of the largest advertising holding companies. Digitas operates in over 25 countries across six continents and is part of Publicis Media. Digitas is committed to helping brands better connect with people through the truth with roughly 10,000 employees across the globe. For the fourth year in a row, Gartner named Digitas a leader in their 2019 Magic Quadrant for Global Marketing Agencies. Epsilon is an all-encompassing global marketing innovator. Epsilon employs over 8,000 associates in 70 offices worldwide. Providing unrivaled data intelligence and customer insights, Epsilon brings personalized marketing to consumers across offline and online channels. Epsilon was recently named the #1 Largest U.S, CRM/Direct Marketing Networks via AdAge and as a leader in customer loyalty solutions for large organizations via Forrester. FCB West is the global strategic and creative partner to some of the most iconic brands in America. Their focus is driving consistent and sustainable growth for industry-leading brands by focusing on delivering the next new customer. FleishmanHillard is a global PR & digital marketing agency focused on crisis communications, brand marketing and paid & organic social media to maintain a positive image. FleishmanHillard is part of the Omnicom Public Relations Group and has more than 80 offices in 20 countries. Awards include 2019 PRWeek U.S. Outstanding Large Agency, and Top Companies for Executive Women ten years running. Frog is a global design and strategy firm that transforms businesses at scale by creating systems of brands, products, and services that deliver a distinctly better experience. They work with an emphasis on evoking emotion in the consumer to result in experiences people love. Goodby, Silverstein & Partners is a creative company that puts people at their center. They work to create experiences that reach millions but seem to only speak to the individual, creating a mass intimacy effect. You likely saw some of their work for Pepsi in this year’s super bowl ads. Grey West is an ideas company on a mission to make the world’s most ambitious brands play a meaningful role in culture. Grey ranks among the world’s top advertising and marketing organizations, serving one-fifth of the Fortune 500 in 96 countries. H&L Partners is a fully-integrated agency, handling everything from creative, strategy, media, insights, production, digital. PR and social. For over 33 years, H&L has led global marketers to success in driving more business. Havas Worldwide is an award-winning, fully integrated global advertising company, specializing in marketing, design, advertising, and corporate communications. The agency works on a mission to make a meaningful difference to brands, businesses, and people. A global leader in brand consulting and design, Landor helps clients build agile brands that thrive in today’s dynamic, disruptive marketplace. Landor has 26 offices in 19 countries, working with a broad spectrum of world-famous brands. With smart tools and global resources, they examine the implications of every brand choice, create new experiences, and open doors to opportunity. Organic is an interactive advertising agency that uses information, data science, strategy, engineering, and creativity to communicate messages to consumers. It is their mission to truly understand the customer and their journey because that is how they find opportunities to make a genuine impact. The digital pioneer company has a heritage in building interactive solutions for Fortune 500 clients. Publicis Sapient was named a leader among global digital business transformation accelerators via Forrester. As digital pioneers with 20,000 people and 53 offices around the globe, their experience spans technology, data sciences, and consulting. Publicis Sapient unlocks value through a start-up mindset and modern methods. QuinStreet is one of the largest and most successful online performance marketing companies in the world. It matches high-intent consumers in one of the nation’s largest media networks to the right solution and the right client. Their industry-leading segmentation and matching technology platform allows marketing clients to target and reach “research & compare” customer prospects. The Outcast Agency is a communications and marketing firm made up of a team of strategists and creatives who have a hyper-growth mindset to drive change and create value for transformative companies at all stages. Offices span across San Francisco, New York, Washington DC, Los Angeles, Seattle, and London. Venables Bell & Partners is an internationally recognized independent San Francisco advertising agency founded on good intentions. With profitable growth every year since their beginning in 2001, their approach has attracted blue-chip brands. VMLY&R is a global full-service marketing agency that harnesses creativity, technology, and culture to create connected brands. The agency is made up of nearly 7,000 employees worldwide using data and insights to reimagine the entire connected consumer experience.